The beauty of the endless poppy fields stood in stark contrast to the events that took place there less than a year before. Red carpet of Anemone coronaria flowers in Shokeda Forest in Southern Israel. 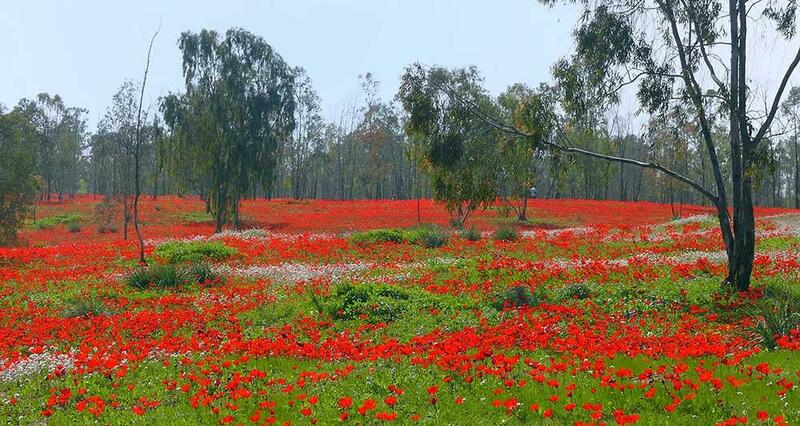 The vast red carpets of anemones have become a major tourist attraction of the northern Negev region of Israel in recent years. (Image by Zachi Evenor צחי אבנור, released under Creative Commons CC-BY license. 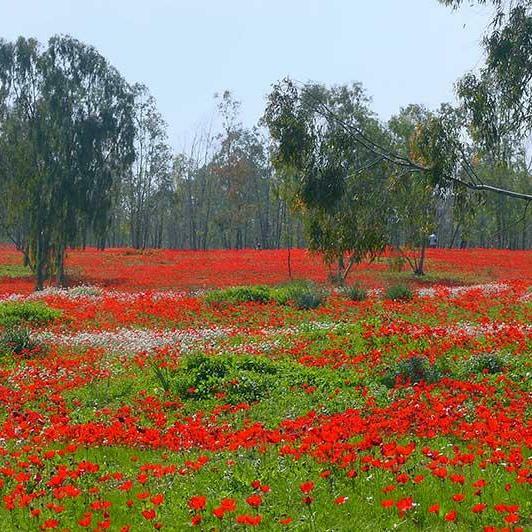 "Drom Adom" means "The Red South" in Hebrew and is the name given to the brief time of year when the fields are awash with glorious and vibrant red poppies. They spring up after the winter rains and dazzle us with their beauty and promise. At about the same time, around Tu Bishvat (the holiday of the trees) occurring in February, the almond blossoms sprout along the road to Jerusalem, filling the air with beauty. Thus, it was last weekend that my husband and I and two close friends, arose early in the morning and made our way down South. The signs pointing toward the South are also the signs directing us toward Gaza. On we went, passing through the fertile coastal plain, past Kiryat Malachi, down to Ashkelon. We went still further, toward the northwestern part of the Negev. Soon, we had reached our destination, Kibbutz Be'eri, and in close proximity, Gaza. We got out of the car and saw many people enjoying the beautiful sunshine. We took off our heavy jackets, and wore light sweaters instead. We took in the cacophony of cascading orange tangerines and thick, tasty cheeses for sale surrounded by bicycles and families out having a picnic. We walked through the fields and took pictures of the huge meadow of orange red flowers, waving in the sunshine. It was as though there should be the sound of trumpets, heralding the end of winter and the promise of spring. The field was endless and there was just enough wind to make the flowers dance and sway in the breeze. Eucalyptus trees were also in abundance, and a smattering of yellow mustard and little violet flowers. We smiled, oohed and ahhed, thoroughly enjoying ourselves as we walked through the glorious landscape. Later, as we were eating some sandwiches, I went to get coffee among the many vendors selling jams of all different flavors, made on the Kibbutz. People were picnicking, riding their bicycles with children running and laughing. The summer of 2014, it was not like this. This area was very different as the rockets from Gaza relentlessly rained down upon our population and, in particular, those living in the south. All at once, while sitting in the sun, I became aware, again, of the sacrifice our brave and very young boys make to insure the safety and the continuation of our beloved homeland. All at once, the suppressed fear, horror, and anger of those days came flooding back once again. My son was engaged to be married at the time. My future daughter in law and I held our breath for fifty days while the war raged on and on and we lost soldier after soldier. The devastation in Gaza was also unbearable. I tried unsuccessfully to get small kids out of there as the conflict raged on. My heart broke at the loss of life. During that time, I slept in fits and starts of no more than an hour at a time. As the day of my son's wedding approached, I grew more and more frantic. Finally, three weeks before the wedding, a ceasefire held. My boy came home, and we ran to get his suit and take care of last minute details. When he broke the glass and swooped his bride into his arms, his army buddies ran up to the chuppah, and grabbed him and threw him up and down on a large white sheet. It was as much a celebration of life itself as it was a celebration of the wedding. I tearfully and emotionally called him to thank him and, in his typical fashion, he cracked a joke and told me I was most definitely welcome. With a sigh of relief and gratitude to God, we continued our day in the vibrant and beautiful Red South.